I was down in Nakhon Si Thammarat earlier this week, wandering around one of the country’s holiest wats, Wat Mahathat, when my facebook alert chimed in my pocket. I stepped outside of the temple and discreetly looked at the message. My friend Baimohn asked what I was up to in two days. 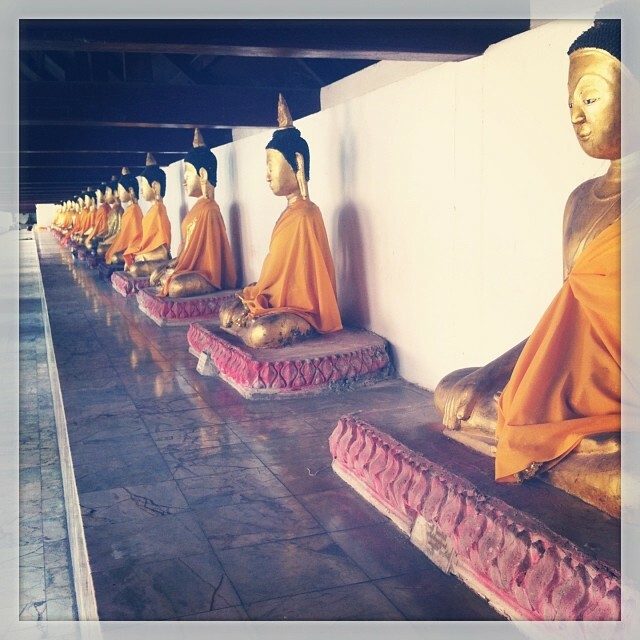 I wrote back, saying I was in the South of Thailand just traveling around. I asked “why? what do you have in mind”. He proceeded to type back a message that he and some friends were going up to a rice farm, and would I be interested in joining? I booked my plane flight home for the next morning on the taxi ride back to my guesthouse. 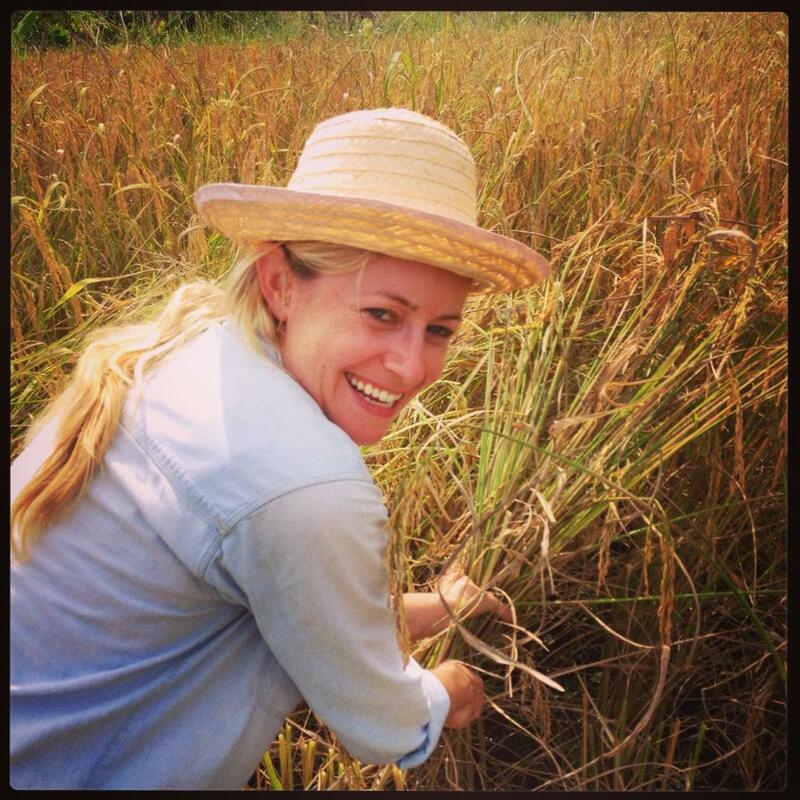 Getting to learn about rice harvesting directly from the source trumped any desire to hunt for the best rice dish in southern Thailand. Eating khao yam nam budu (a specialty rice dish originating in the south, with a fermented fish sauce and a heavy hand of herbs) would have to wait til next time! I met Baimohn in the wee hours of Saturday morning, along with his three friends, Nhoi, On and Ton, and we drove up to Chonburi, making pit stops for food, coffee and bathrooms along the way. We arrived a bit late to the group that had already gathered, but we were right on time for rice massaging. We walked into a room of people shuffling their feet atop large mounds of rice. I slipped off my sandals and joined the dance. 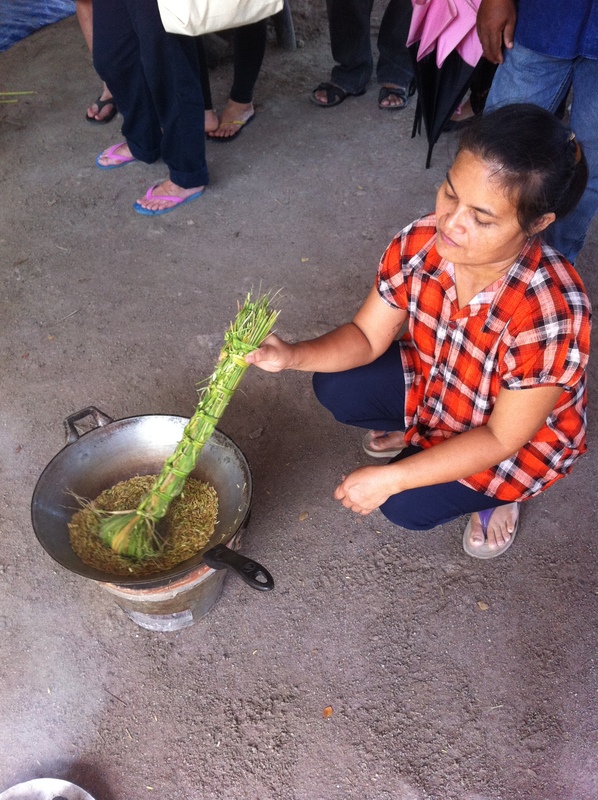 We then watched as the farmers went through the process of toasting the young green rice (harvested a month earlier than your typical rice), smashing it in a giant mortar and pestle device (to remove the hull), pick out the unwanted shells, and then puff the rice in a hot walk, with no oil. The addition of freshly grated coconut and brown sugar made for a tasty treat. Then, one of the farmers went and grabbed an old coconut that had sprouted a shoot (much like an old garlic or onion) and whacked it open with a cleaver. He showed us something I had never seen before. 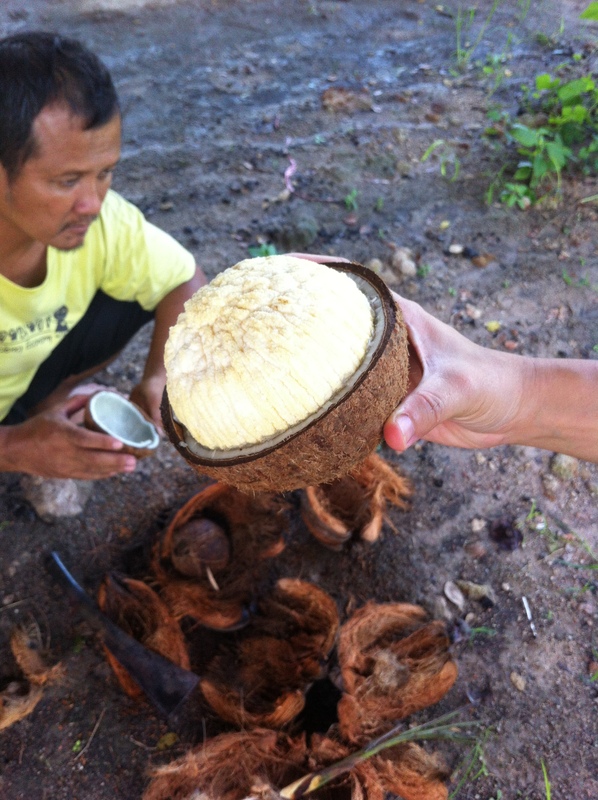 Inside the coconut was a puffy, fluffy white growth called jow maprow. You pull the whole ball out and shred off pieces of the meat, like nature’s cotton candy. Nhoi was telling me that when she was a kid, most people would discard them and just use the coconut meat, but for her, they were instant sweet treats. I loved the texture of the coconut cloud, but I especially loved the fact the I learned something new. I’ve drank probably thousand of coconuts in Thailand, yet had no idea that mature coconuts had the ability to have coconut babies, if you will. Around noon, we saw some of the ladies sit down in the kitchen and fires being stoked in charcoal burners. 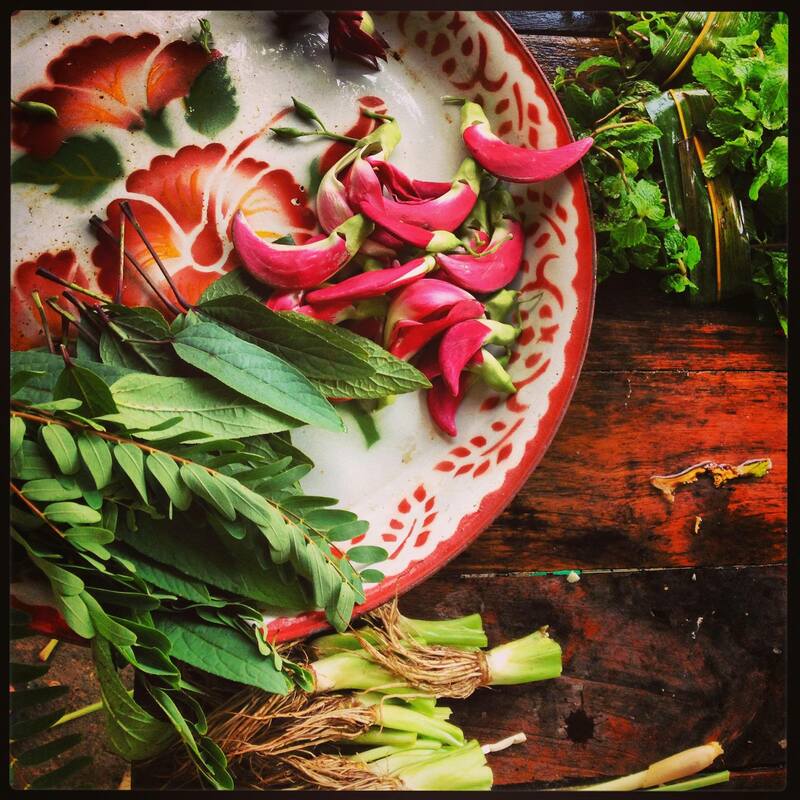 We were given the task of collecting herbs for the nam prik, or fish relishes that were being prepared. We went around the garden and collected sour leaves, ferns, hibiscus flowers, bitter leaves, butterfly pea flowers, and anything else that was edible and scrumptious. Nhoi and Baihmon worked on the platter and created something not only tasty, but beautiful. 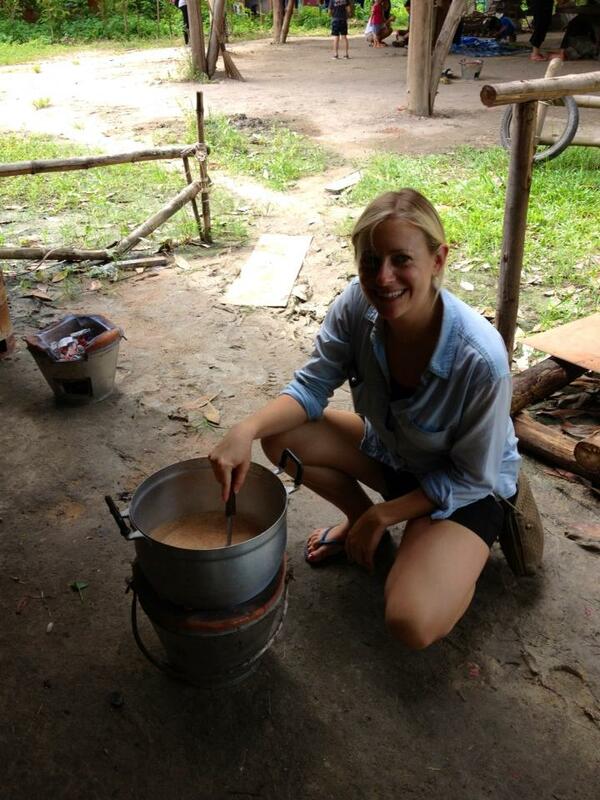 While they were working on the nam prik, I was helping with the curry. We made a feast, each contributing where we could, and me scribbling away notes on everything. 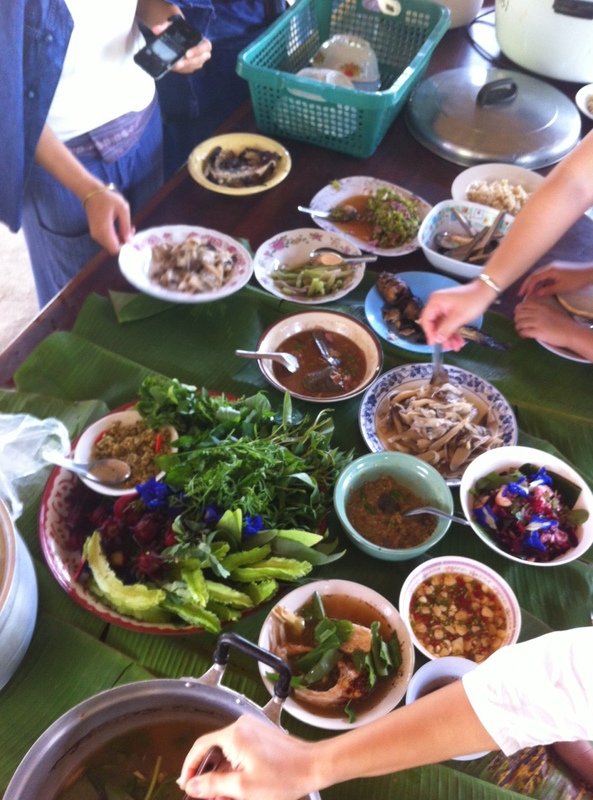 We stood around the table, filling our bowls with warm rice and topping it with all the freshly prepared dishes. I’m not the biggest rice fan in the world (perhaps this sounds like on oxymoron considering Asian food is my passion), but this rice was different. 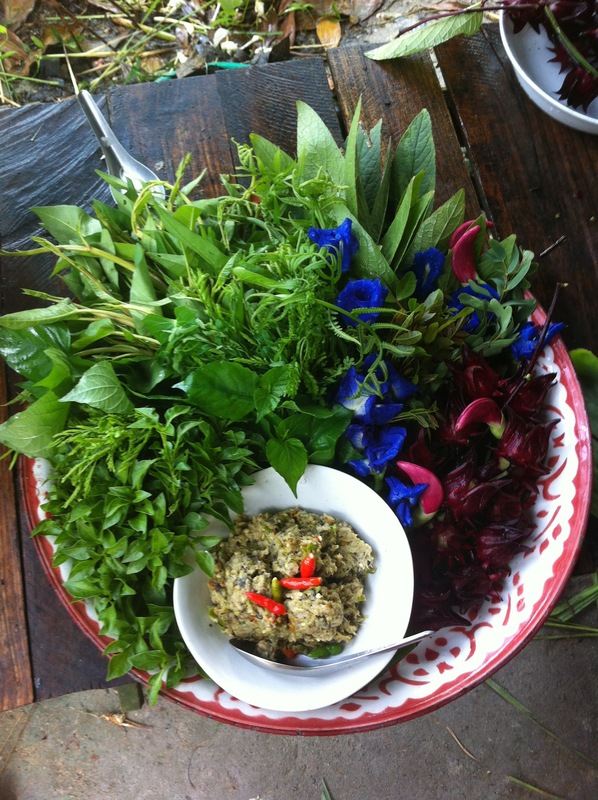 I put a small amount in my bowl and expected to just push it around as I focused on the relishes, curries, stir fried veggies and fresh herbs from the garden. I took a small mouthful of rice, just to reassure myself that there couldn’t be much difference with this rice and all the other rices I’ve ever eaten. But as I chewed, I realized this rice was not like any other rice I’ve ever had. 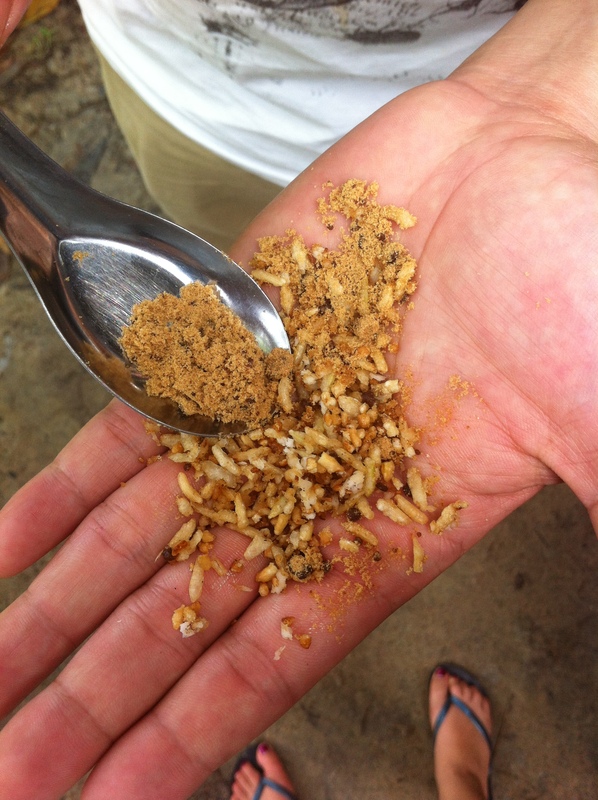 The grains were slightly chewy and they tasted nutty, slightly sweet and fresh. I moved the rice around over my tongue, incredulous that I’d truly never tasted a yummy rice before in my life. This wasn’t just a jasmine rice, or Uncle Ben’s brown rice. There was a distinct aroma, a lightness and a flavor that prompted me to actually have a second bowl! It wasn’t just a vessel for the curry; I wanted to enjoy the rice just as it was. After we had scraped the last bits of each dish into our bowls, and thus into our tummies, we didn’t take a moment to breathe. 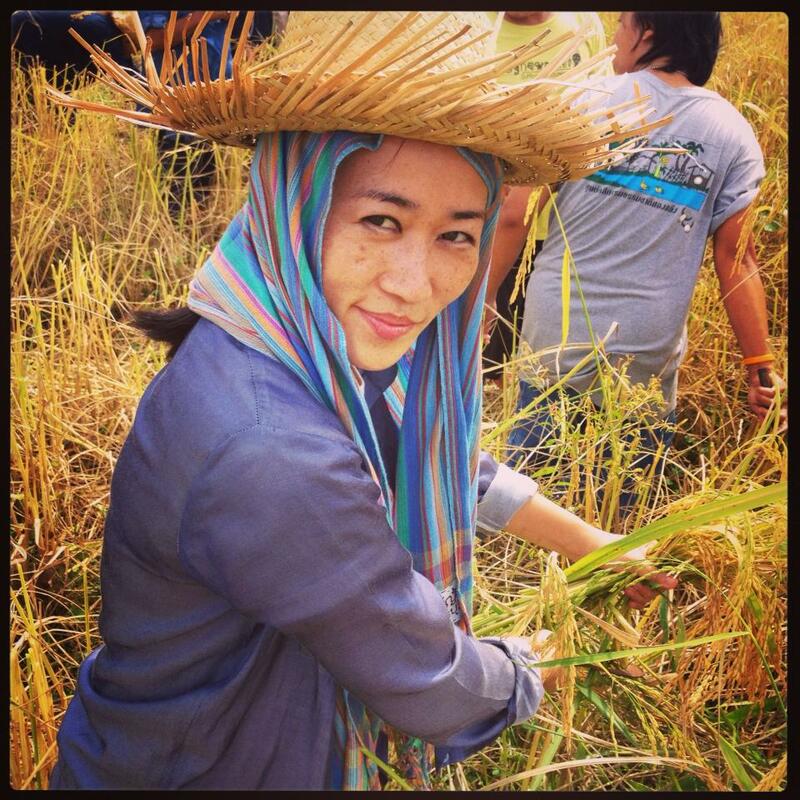 We were marched straight out into the rice fields and each one of us was handed a scythe. We were given a quick demo on how to take down the stalks in big handfuls with one smooth move of the scythe. We slipped off our sandals and gingerly slipped into the mud. It was uneven footing and I kept having these flashing images of me making a wrong move and landing face first in the mud, potentially on my scythe! So I worked carefully at first, making sure to cut the rice just so. But as I got into a rhythm, it was actually really fun. 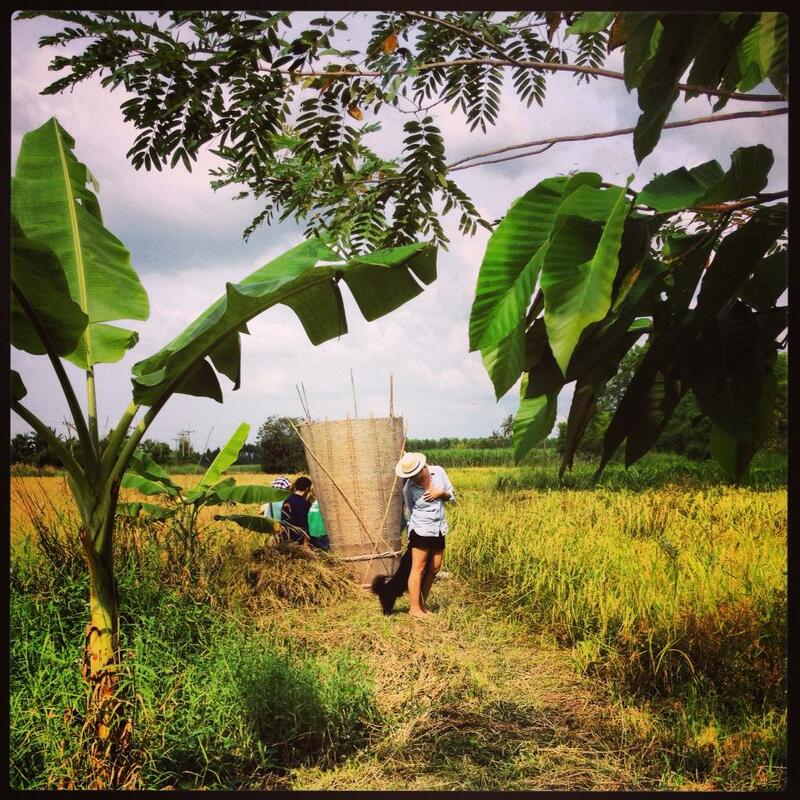 We all moved deeper into the rice field, some working quicker than others. 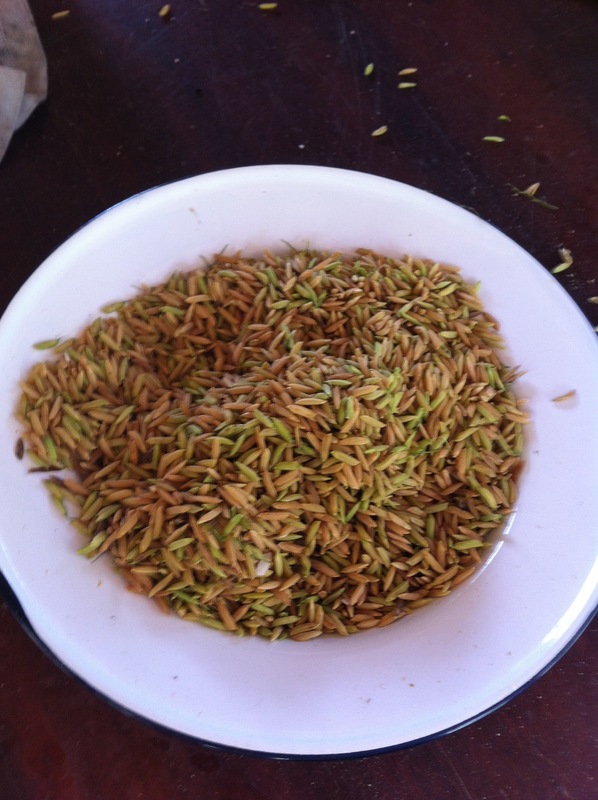 It felt a bit like a race, as some of us cleared our portion of the rice faster than others. We cleared the majority of a field in about half an hour and then went on to whack the grains against what looked like a giant washboard. 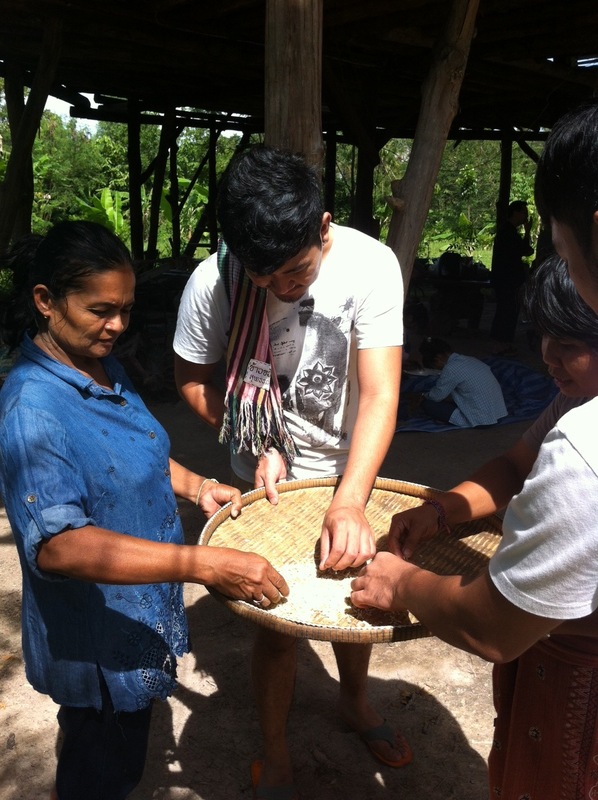 We grabbed big bunches of rice and thwacked away, until most of the grains were at the bottom of a barrel. We were all a bit exhausted at this point, so it was excellent timing when a vendor cycled past selling chilled drinks. He stopped and made sweet iced Thai teas, sour lemon drinks and milky green iced teas. We walked back to the main area where we had lunched and sat and sipped and talked about our day. We were all excited about what we had learned, and we all could say we felt confident with a scythe. I may just add that to my resume! We thanked the farmers for educating and entertaining us, then hopped in the car. And away we drove, to the second half of the day where we explored a small village and a fish market. My second wind kicked in and off we went, buying new items to bring home and experiment with, and sampling the freshest seafood. These are my kind of friends– a day revolving around playing with food, eating food, and exploring new food markets. 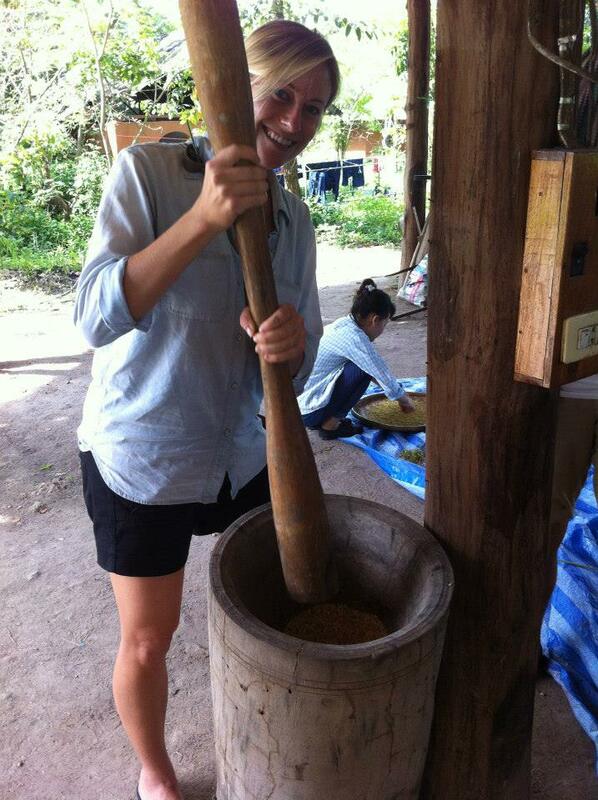 I struck it rich with my friends in Thailand…it’s as sweet as rice pudding.